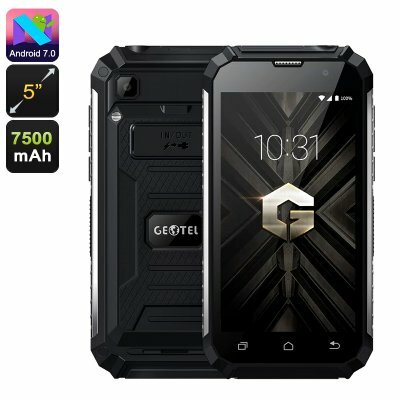 Successfully Added Geotel G1 Android Phone - Android 7.0, Dual-IMEI, 3G, Quad-Core, 2GB RAM, 5-Inch HD Display, 7500mAh, Google Play to your Shopping Cart. The Geotel G1 smartphone is a highly affordable Android phone that follows you anywhere you go. Thanks to its rugged design, it has been designed to withstand a hit. Therefore, you won’t have to worry about accidentally breaking it when it gets dropped onto the floor. This rugged Android phone is great for people who work in rough environments as well as for outdoor enthusiasts. With this Android phone in your pocket, you’ll stay connected to friends and family no matter where you’re headed. Talking about connectivity, this rugged smartphone comes with Dual-SIM card slots and two IMEI numbers. Thanks to this, your phone lets you stay reachable on two phone numbers at the same time. This makes it the perfect device for those of you who wish to separate work and private life by using only one smartphone. It furthermore treats you to 3G. This lets you browse the web even when you’re not at home. Thanks to this, you’ll always be able to access the internet. Android 7.0 treats you to a smooth and lag-free experience. With its Quad-Core processor and 2GB RAM, this cheap Android phone allows you to tackle all the latest basic Android features available. It furthermore treats you to 16GB internal storage and a 32GB SD card slot. Therefore you can be guaranteed that there’ll be enough space to store all your files and media. All your favorite entertainment can be enjoyed on the phone’s beautiful 5-Inch HD display for days in a row. Coming with a powerful 7500mAh battery, your cell phone provides you with an unbelievable 24-hours worth of continuous usage time. The battery can furthermore be used as a power bank to charge other electronics. The Geotel G1 smartphone comes with a 12 months warranty, brought to you by the leader in electronic devices as well as wholesale Android phones..